Are you an ebook reader? Or, are you curious about ereading? From May 15th to June 1st, all of the readers who use Library2Go can check out the same book. It's part of a pilot program called the Big Library Read. 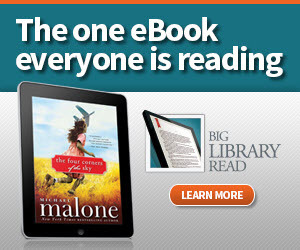 During the program, all readers can download the same book - "The Four Corners of the Sky" by Michael Malone - from Library2Go. "The Four Corners of the Sky" is master storyteller Michael Malone’s novel of love, secrets, and the mysterious bonds of families. Malone brings characters to life as only he can, exploring the questions that defy easy answers: Is love a choice or a calling? Why do the ties of family bind so tightly? And is forgiveness a gift to others…or a gift we give ourselves? This is an opportunity to unite readers – and loyal library supporters – all over the world around a single ebook. Together with Sourcebooks, the independent publisher of this title, OverDrive and your library are providing a compelling novel for all to read – with a valid library card, of course. We are proud of WCCLS' award-winning librarians!